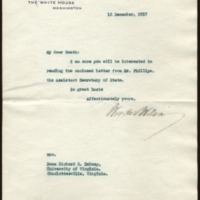 Woodrow Wilson writes to Richard Heath Dabney, enclosing a letter from William Phillips, Assistant Secretary of State. I am sure you will be interested in reading the enclosed letter from Mr. Phillips, the Assistant Secretary of State. Wilson, Woodrow, 1856-1924, “Woodrow Wilson to Richard Heath Dabney,” 1917 December 12, WWP20529, University of Virginia Woodrow Wilson Letters, Woodrow Wilson Presidential Library & Museum, Staunton, Virginia.